SecuriTape -The system is designed to use existing type of tape available in the industry and commonly used for the carton sealing requirements. It is up to the individual user to choose (where the supply is possible), his own type of film and adhesive base. Water-based Acrylic and Hot Malt are commonly used to suit the purpose it is intended. Solvent based Acrylic is also a very good option. 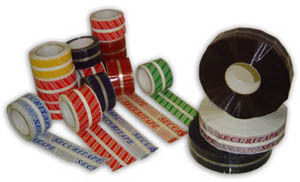 The style of PRINTED TAPE "SecuriTape" is unique and exclusive to SecuriTape system. As a stock item of printed SecuriTape we offer a Poly Propylene base tape with water based acrylic adhesive. We can supply to order, any type of tape as above. Silent tapes are also available on application.